Have you ever had one of those conversations where you weren't aware of time, and you were just enjoying the moment? I spent an afternoon talking with Henry Joyner and discovered we shared many of the same interests. Chrissie asked me what Henry could be talking about for so long! In this day of social media, technology, and the busyness of life, it was uplifting to sit down and have a conversation just to hear someone's story. Did you know Henry has been a television reporter and a cameraman, or that he once worked for the National Enquirer? I couldn't help asking if he ever wrote about alien abductions and we had a good laugh about that. Henry never did write alien stories! He has always enjoyed writing and photography and was an English major in college with a minor in journalism. He had a few gigs as a wedding photographer and did some tabletop photography for magazine illustrations. Now I guess you know why we spent so much time talking that afternoon. If you are familiar with Henry’s spectacular wood carvings you know he is very talented and creative, but did you know he also draws, paints, and sculpts? I was captivated with the caricatures and the details I found in them. You can examine them and always find something new you didn't notice before, and the stories he carves into them are so characteristic of life. Henry’s favorite material to work with is wood, and he senses a spiritual connection to the trees and to God the creator when he works with it. There is something about working with wood, a sense of awe and admiration for an organism created by God during the creation of the world that we couldn’t do without today. I thought about Henry's characters and how each one is special, and there would never be two that were exactly alike, each of them telling a story with carved details and hand shaped with love and care. I thought God must be doing something similar when he makes each of us, different as can be, with stories as varied as each personality. Henry says he carves away what doesn’t look like what he is making and maybe that’s what we should be doing too, carving away everything about us that doesn’t look like Jesus. I couldn’t help thinking about dynamite in small packages after I heard Samantha Boutte’s story of what it was like to attend the firefighter training academy and I learned that when you are loaded with grit, determination, and a lot of devotion to God, there is not much that can get in your way. She never had dreams of being a firefighter, but when your prayers open another path and everything lines up completely, you can be pretty sure God has you there on purpose. Fire academy training is demanding, and when you are the smallest person in your class, and one of two women, you must be ready to hold your own. Samantha prepared mentally by setting two goals. She would not be the last person to finish anything, and she would not show weakness. Samantha prayed and relied on God and adrenaline to get her through. The training was demanding, but the hardest part was being separated from her kids because everything she does is centered on caring for them, teaching them values, and being a role model. Samantha works with hazmat reports and safety issues, and she is training to be an EMT, someday she may be part of the suppression team. She is on a mission to be the best person she can be, to do what God calls her to do, and to support this church with a willingness to work and give back to the community. Samantha told me she knows when leaving her house every day that she is representing more than just herself, she also represents her faith, her parents, her church, and her job. I considered Samantha’s journey and how she never expected firefighting to be a part of her life, yet when she looked back, she could clearly see how everything fell into place. I thought about what Pastor Jon said last Sunday when he told us to live into our intended purpose and how God’s light is inside all of us and that light must come out. He explained how one person can’t shine the light for the entire world, but we can shine it wherever we find ourselves. Samantha prayed, listened, and followed the path to find her purpose and her place to shine, and with her determination and grit, sunglasses may be needed at the fire station. I talked last month about getting to know someone new, so what better way to start the new year than for me to do that. I attended the symphony Christmas concert, and to my surprise, Lance Orta was the featured soloist. That was exciting, and I wanted to tell everyone that Lance sang at my church! I felt this was a sign that I had found my next Heartbeat story. I assumed Lance had been singing and performing since he was a child and that it really wasn’t a big deal to get up in front of hundreds and sing your heart out. I soon learned that wasn’t the case at all. A shy kid with a spectacular voice just seems to be one of those illogical things God always likes to do, sort of like a built-in obstacle to character development that turns us into the person we are meant to be. Lance joined Renee’s high school choir as a freshman and was content to remain in the background until he realized you could get a letterman jacket for singing a solo, and the attention you received from the girls was an unexpected bonus. He decided to try out for a part singing ‘Circle of Life’ from The Lion King, and this quiet kid surprised everyone who heard that audition. Lance was able to conquer his fear because he knew singing was what he was meant to do. It led him to DePauw University where he majored in vocal performance and experienced opportunities to travel and sing, including the White House for Christmas carols. Lance told me music is more than just music, it brings people together, and it is a part of something bigger than just the music itself. Music defines moments, it lifts our spirits, it plays on our emotions, it lives in our memories, and it is hard to imagine life without it. We talked about community and how it feels to be a part of this one, to be a part of something that is bigger than yourself. God gave us all a purpose and finding that purpose despite the obstacles we encounter provides meaning to our lives and develops us into who we are called to be. Lance found his gift, and we get to be part of his journey as he is a part of ours. Who knows, maybe some Sunday we will hear him sing ‘Circle of Life’, I know I would love to experience it. You can’t begin to know and appreciate another person until you sit down together and talk about life and the joys and struggles we all experience. This past year has been full of stories, and each one has shown me how much we are alike and how much we can learn from one another. I spent one morning at Dr. Bill Graber’s house on Audubon Place, which is a bit humorous since he is an avid birder. When I thought about him and the stories he shared, I realized that all of them seemed to drift back to his beautiful, late wife Laura Lee, his children, and his medical practice. We did talk about birds and his life list of over 700 different species, and he told me when he was in the second grade, the teacher divided the class according to their ability to sing. The best were redbirds, the next were bluebirds, and the kids who couldn't sing, those were the crows. We had a good laugh when he told me he was one of the crows. I noticed the love and pride in the tales of his children and my heart was warmed with joy and sadness when we talked of Laura Lee. There was a beautiful painting of her above the sofa where we sat. I also realized that he didn’t talk about his accomplishments as much as he sang the praises of others. We spoke of Renee Kloes and her incredible piano skills and of John Wright and his meal planning talent at Kairos kitchen. Dr. Graber is a faithful Kairos kitchen helper and has cut up more onions than most people do in a lifetime. 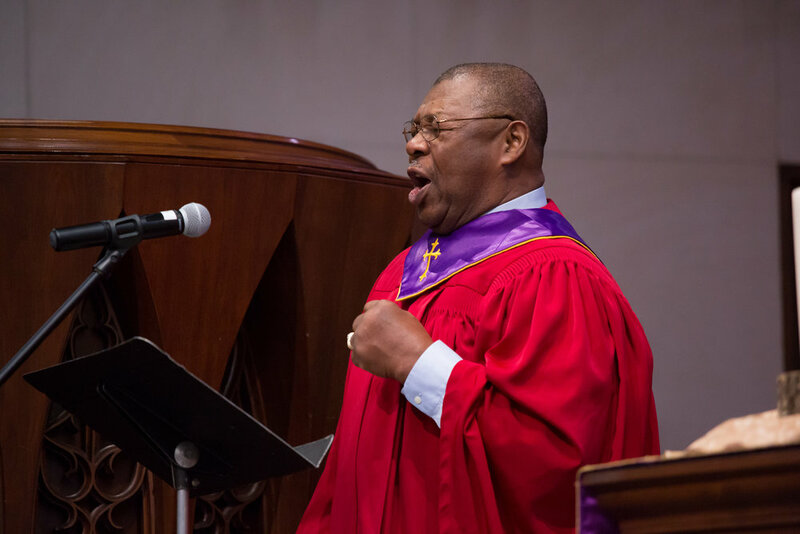 He started attending FUMC when he was eight years old and told stories of kids trying to count the pipes in the organ when things got boring. Did you know there are three generations of Graber doctors who have provided continuous medical care for almost 100 years or that in addition to birds he also likes to identify butterflies when he goes to Mexico every year? You learn all sorts of things when you listen and sharing stories connects us and draws us closer together. The Christmas season is an excellent time to share a story with someone you see every Sunday but don't really know anything about. God made all of us different and the more we know about each other, the more love we can share, and sharing love is really what life is about. When I asked Jean Lindsey to talk with me about her life, her faith, and her church, she was quick to say there were plenty of others in the church that had better stories and would be more dynamic and inspiring. I knew there was something special about Jean, so I was not going to let her talk me out of an interview. I wanted to discuss prayer because I had heard she was a prayer warrior. I was not familiar with that term and assumed it meant someone who either prayed a lot or was good at praying out loud, but if you look at the definition, it states that a prayer warrior is committed to praying for others. She may be small, gentle and soft-spoken, but I learned about the warrior that she truly is. She is relentless in her prayer life, fierce in her love for this church, and utterly devoted to God. She works hard to find out who needs prayer, writes down names and spends time praying for them, you can be sure if Jean says she will pray for you, it will get done. Praying is something that Jean has been doing her entire life, so I asked if the answers ever became easier to understand. She thought about this but said no she still has a hard time figuring out what God may want from her and worries if she is doing all that He needs her to do, but she has confidence that He is there, and He will guide her. We laughed together when she told me sometimes she wishes God would email her every morning and tell her what to do. As we talked she laughed at my request for words of wisdom and inspiration but thoughtfully told me people need to know they are loved and are important, be patient and kind, encourage people, don't bring them down, love is what we need. Remember that everyone is made in the image of God, sometimes you just have to look really hard. She told me about a passage she read from Max Lucado that said when we step into heaven we will be just like Jesus. She looked at me and said, "Won't that be wonderful?" Her eyes were shining, her smile was beautiful, and I don't believe an angel could glow as much as she was at that moment. I know I saw Jesus today when I spent time with a prayer warrior. Listen in as Michelle sits down with Jean Lindsey to hear stories about her life and journey of faith. When I started collecting the stories of First Methodist earlier this year, I never knew what I might discover or where these stories would lead. I never expected to hear tales of cowboys and cattle drives, model Ts and firefighters, lions and monkeys in Beaumont, and POWs at Tyrrell Park. Bob Brandes at 91, is full of memories and he gave me a time traveler’s glimpse into the past. His family has been a part of First Methodist for generations with membership in its steeple, dome, and spire churches. Bob was baptized in the dome church in 1929 and married there several decades later. He has been a part of this community for most of his life, and I couldn't help but think of the sermons we have heard these past few Sundays because Bob's journey has included lots of good food shared with many of God's people. These people grew up together, played together, and became God's people together, sharing their stories and their lives along the way. There are accounts of beach trips and badminton, coffee club and cake, young love and marriage, of children, work, church and growing older together. The experiences in life that make us who we are, the things that bring us joy and the events that make us sad, the collective memories that make up the narrative of our lives. Bob spends time in the archive room upstairs at least once a week, and if you haven’t experienced that room, you really should plan a visit. It reminds me of a case file room like the police have on tv. There are boxes on top of boxes all neatly organized and cataloged with their contents, each box a witness to the history and story of our community, a tribute to the people that the Spirit brought together. Bob and I talked most of the morning, and he said there really wasn’t anything exciting or unusual about his life, it was just living each day the best that he could. I thought about all that he told me and all that I learned that morning and I realized that each day may not seem exciting, but when you add up the days that make up your life, you understand that each day is another chapter in your journey. A journey as one of God's people, and being a part of that story, well that is about as exciting as it gets. Listen in as Michelle sits down with Bob and he tells stories of growing up here in Beaumont. Fred Simon has a booming voice, is an impeccable dresser, and never meets a stranger, but did you know he is an excellent storyteller? I listened to Fred’s stories and I learned about a man who loved his wife deeply, who rose above the racism of the times and made his own way in the world. Fred has been singing “Old Man River” for a long time, and he reminds me of a river. He just keeps rolling along with his big, kind heart and a twinkle in his eye, trusting in God and spending time in prayer. He had to play a statue in his 4th grade play because if he sang, he drowned out everyone else. He traveled with an evangelist to sing and warm up the crowd when he was a teenager. You did not pick on Fred when his sister was around. She always had his back. His grandmother sent him and his sister to NY and DC during Beaumont's 1940's race riots, and while playing on a rooftop in NY, he witnessed martial arts exercises for the first time. Fred is a 10th-degree black belt and is known as grandmaster Simon. He attended Huston Tillotson on a choir scholarship where he met his wife, Gene. It was love at first sight. He shook hands with President Lyndon Johnson at a Beaumont restaurant, and Fred was speechless when the president said, "You have a good grip son!" Fred and Gene joined FUMC in 1970 and were the first African American family to join the all-white congregation in downtown Beaumont. The day they filled out the membership card, Pastor John Wesley Hardt came to their house to welcome them. The congregation of FUMC embraced diversity with Rosa Dieu taking the lead to make sure everything went well for the Simons. Fred and Gene didn’t take the easy road. They followed the Spirit when it led them to this congregation, and they didn't let racism get in the way of serving Jesus. Fred’s stories reveal a man who took the troubles that life handed out, dealt with them and kept a beautiful, positive outlook. He is an inspiration, and I am grateful for his example. Share a meal and some stories with him sometime and I promise you will leave with a smile on your face and hope in your heart. Pastor Jon told us a few weeks ago that gifts are manifested in many ways, and that everyone has a gift to be used in building up the body of Christ. He said the Spirit knows what is needed for a gathered body to do whatever it is that needs to be done. 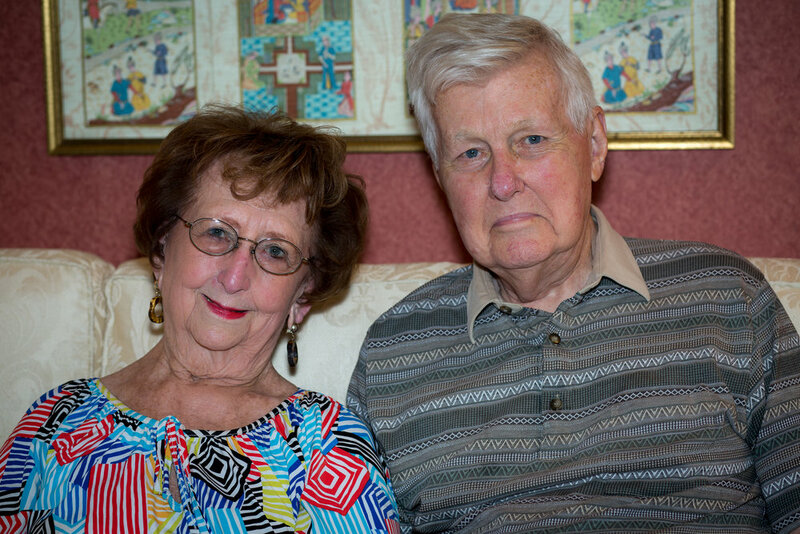 The Spirit must have been working in the fall of 1959 to bring Robert and Bonnie Madden to Beaumont. Robert with his artistic talent and Bonnie with her theater and production skills were just what First Methodist needed to stage some spectacular performances. In 1970, Don Ford, the Director of Music, asked Bonnie to stage the one-act opera, Menotti's Amahl and the Night Vistors. The request was not unusual because plenty of productions had been done in Rothwell Hall, but this one was to be performed in the sanctuary. Could it be done? The altar was moved into the narthex to make room for sets and stage lights. Robert, Lyle Bohrer, and H.L. Taylor designed and built the sets and even made stage lights from coffee cans. I wondered how the two of them worked together and how Bonnie could communicate to him what she needed in her set designs. She didn't hesitate when she told me he always made it work. I saw a few of his set sketches and they looked like an architect’s rendering. Very impressive! The orchestra was placed in and around the communion rail and was directed by Don Ford. Fred Simon sang the part of Balthazar, and a young Randy Crim sang the lead. For two nights in December, the sanctuary was filled with standing room only crowds. I wish I could have seen it. I didn’t know this opera and had to do some research. It tells the story of a poor crippled boy, Amahl, who is visited by the Magi on their way to see the Christ child. Amahl has nothing to give as a gift to the Child, so he offers his crutch. He gave what he had, and for this gift, he was miraculously healed and went with the Magi to see the baby. The story touched my heart and to think of it performed in our beautiful sanctuary was powerful. I imagine it was spectacular. A gift of performance from nearly 48 years ago that still inspires and encourages is reason enough to believe the Spirit knows. Robert and Bonnie enrich the life of our congregation. They use their gifts to provide art and theater, to teach, to serve on committees, and to faithfully contribute their talents in many ways. They indeed are an example of the Spirit knowing what is needed and bringing everything together as only He can. A heartfelt appreciation for the Spire church requires a little reading about the story of the people and the decisions they made to build a beautiful, modern, artistic church designed for the future. It was not an easy decision, but one based on a commitment to serve God in the place they found themselves. They stood firm in a declining downtown Beaumont when most were abandoning it for the suburbs. Each debate and discussion always ended with a decision to remain downtown because “this church is and should remain a downtown church”. The Spire, First Methodist’s fith home since 1840, has been watching over Beaumont for the past fifty years. I thought about all the changes it has been witness to. I took some time to think of all the people who watched this church come to life. People who surely gazed in wonder at the cross high atop the spire. People who worked hard and prayed hard for the success of this church. People who believed in a future of serving Jesus in uncertain and changing times. There was a culture that developed in the congregation of this church, one that reaches beyond 50 years. I learned about people with a spirit of moving forward, always looking toward the future but also believing that you see where you are now by taking time to look back. Throughout the pages of their history are statements such as: “to live is to change” and “this church has never given a little answer to a big question”. One of my favorites was “the church is here, now, seeking to serve the new wilderness”. That seems as relevant today as when it was written in 1968. In the pages of our history you will find people who believed in community, diversity, commitment and social justice. These same people built a beautiful church and left us with a unique cultural heritage. We are living in that future they planned for. Reading this history gave me an even deeper appreciation for the space I worship in and the people I worship with. I know that we can face whatever the future brings because we have the past to show us the way. I read about a sermon given by Dr. John Wesley Hardt for the cornerstone celebration of this church. He spoke about depending upon Jesus as a cornerstone for growth and that He is the one who joins old and new together and holds it in unity. It seems a simple message from the past is also the hope for the future and that depending on Jesus as our cornerstone is what will always keep us united. When your mother teaches piano lessons and you grow up across the street from the Methodist church, it’s not hard to foresee a life destined for music ministry. Janie Greenway has been making music since before she could write her name. Janie went to every lesson her mother taught. She had a child-sized, pitch-perfect piano in the other room where she would play. She figures her mother’s students probably didn’t appreciate all the noise she was making. Learning piano was a part of growing up. Janie couldn’t wait until she turned 14. That meant she could finally join the choir. The choir director also taught Janie how to play the organ. The organ was fascinating and very different from playing the piano. Her summers were spent learning and practicing. Music did become a major part of her life and the ministry piece fell into place as well. Janie is also an ordained minister. She spent eleven years working as a pastor. I asked her if she ever preached her sermon and then stepped over to the organ to play the special music. She smiled and graciously told me no. First Methodist was extremely fortunate when Janie moved to Beaumont. She has been the organist here for the past 22 years. She still gets nervous and she still practices her hand and pedal exercises. I asked her if she had a favorite piece to play but she told me no, it’s more about moments. The moments she accompanies the choir and they perform a piece that comes together perfectly. I knew exactly what she meant. It’s the Sundays when you know something powerful just happened, but you can’t describe it with words. You realize this is how music must sound in heaven. I got to observe Janie practice one Friday afternoon. The sanctuary was dark and there was a sacred quietness in the space. The organ made an airy sound when it powered up. It was like a living, breathing spirit was waking. A spirit that had been waiting for Janie to bring it to life. I know Jesus is present on Sunday, but I also think He is there every Friday to hear this kind, gentle musi- cian fill the air with beautiful music. I’ve always loved the means of grace even before I knew what the means of grace was! My mom loved to tell the story of when I was about four. I had seen a church sign about Pontius Pilate and asked her, “why would ‘punch the pilot’ want to kill Jesus any- way?” One time in the sixth grade, I went to church and the pastor preached about Samuel's call in 1st Samuel 3 of the Old Testa- ment. He asked the congregation if we had ever heard God call our name. I wanted to stand up and tell him, “Yes!” But I was a little timid in that Pentecostal congregation. In the eighth grade, when I was attending mass at Saint Ann’s Catholic Church, I saw my best friend Chris who was an altar boy hold the book for the priest saying mass. I knew then that the place I belonged was at the altar presiding at the Lord’s Supper even though I couldn’t talk about it that way yet. When I got to seminary and found out that the founder of Methodism, John Wesley, had named the usual means of grace as one of the ways that we know, experience, and receive God‘s love on a consistent and Scriptural basis, I was overjoyed! The usual means of grace are prayer, searching the Scriptures, the Lord‘s Supper, fasting, and Christian conferencing. Even though I did not know those words while I was growing up, I was already interested in keeping these practices and becoming a fully devoted follower of Jesus Christ. Now as a pastor, it is my joy to share these practices in the Christian community so that we may all deepen our devo- tion to follow Jesus Christ. The means of grace offer us the method that brings us to a greater depth of faithfulness and Christian community. These means of grace are in fact the Good News of Jesus Christ put into practice by his disciples. These means of grace drive us inwardly in the practices of piety, devotion, and worship, and drive us outwardly in greater avenues of mercy, justice, and compassion. When John and Charles Wesley were at Oxford they put these practices into place in their life and formed what they called the "holiness club.” That’s how they became known as the “Methodists," they had a method to living out their faith in Jesus Christ. I invite you to come learn more about the practices that we call the means of grace, both as a time of learning and growing togeth- er, and as a time of putting our faith into action as we begin the new year together.